What can be done with some bright graphics and crisp photos that demand attention. It’ll make your customers run for that product. It can give you the power to recapture the attention of people who passes by and bring them back when they’re ready to buy. In short, they help you in keeping your brand in front of your customers. Trade shows are all about capturing attention, drawing foot traffic and making impressions that turn those in attendance into clients and customers. Trade show displays typically include a header graphic with your logo and tag line, and several supporting graphics to showcase your products and services emphasizing the features that differentiate your offering. 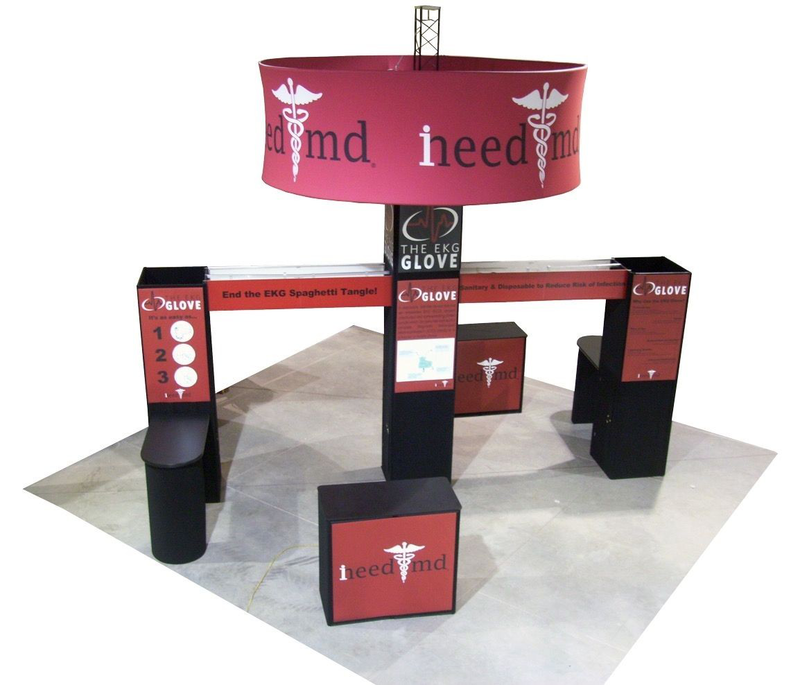 You can get a complete portable trade show display booth created, produce pop up booth graphics for your existing display, or provide accessories like banner stands and easel signs. Here are some trade show display exhibiting options to choose from which will help you in making your next event a huge success. This consist of knit-polyester graphic sheets that wrap around and zip shut over metal frames, which can be assembled and disassembled in a few easy steps. They’re easy to clean, fold and carry, and they’re inexpensive to replace or modify. The modern, striking, state-of-the-art appearance of the modular truss style of trade show displays is popular among vendors who wish to stand out on the floor at trade show events. It can be set up quickly and easily by hand. Any type of display can be assembled with simple twist-and-lock motions — no tools are needed. A collapsible set of panels that can be propped as one of the lighter weight display types, the pop can easily be carted around, set up at trade shows and other public events. It comes up with bold graphics and logos that are designed to boost brand recognition among trade show attendees. Everything you need consists of roughly the same weight and travel space as a poster tube. The concept behind banner stands is one of compactness, where the graphic sheets roll out from a tube and hang by a stand, then roll back in to be transported to the next event. Flags are another option suited for the outdoors, particularly among vendors who prefer to make things simple yet eye-catching. You can have a line of flag displays produced in the different shapes. Displays that hang from above like chandeliers or overhead lights. Made from extruded aluminum and available in a variety of shapes, hanging displays present the colors, symbols and logos most prominently. Trade show displays don’t end with the contents of a given kit. Since, numerous things can be added from the above list to make a hybrid that makes your display even more alluring to consumers and investors. Ergo, pull in your best-selling products and generate thousands of different ad sizes that display across the fair. This will recapture lost sales in the background, while you focus on other parts of your business. Here at nonsociety.com we show you how to live life on your own terms and avoid falling into dreaded boxes. You don't have to be a broke hippy to live differently to today's societal standards - but we strongly suggest that you march to the beat of your own drum...and we aim to give you the confidence to do just that! Copyright © 2019 nonsociety.com. Powered by WordPress. Theme: Accelerate by ThemeGrill.